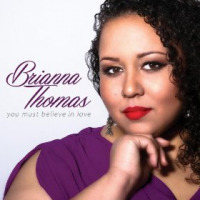 Ms Thomas, from Peoria, Ill. has sung with jazz greats such as Clark Terry and Wynton Marsalis both at home and abroad as well as being a jazz educator teaching in New York City schools. This is her debut CD. A varied selection of songs - standards such as Bye Bye Blackbird and Duke Ellington’s Daydream; Stevie Wonder’s Never Dreamed You’d Leave In Summer; You Must Believe In Spring (Michel LeGrand); and 4 original songs, including the entertaining Bree’s Blues - sung in a pleasing, ‘smokey’ toned voice accompanied by musicians who, needless to say, are well up to the job. Personally, I found some of the tracks unappealing as the distinctive style of singing didn’t really grab me. Too much pointless scatting, too fussy and over-dramatic. I’m even tempted to say that Ms Thomas is a better song writer than performer, as her own songs were rather good. The guest soloists did well, especially the unusual harp on Lover Of My Soul; this song was a love song (original) with a hymn-like quality. Another original I Should Have Known included a Wycliffe Gordon trombone solo which sounded as if the player was talking through the instrument. This was very skilled playing but I’m afraid I found it rather disconcerting – other tracks had trombone solos which were more pleasing, straightforward and even tender-sounding. The tracks I did enjoy included Daydream, with its long effective piano solo; In A Mellow Tone, which was very mellow, particularly the Marcus Printup trumpet solo: Stardust, with just voice and bass; Bree’s Blues and You Must Believe In Spring, which was sung to guitar only.